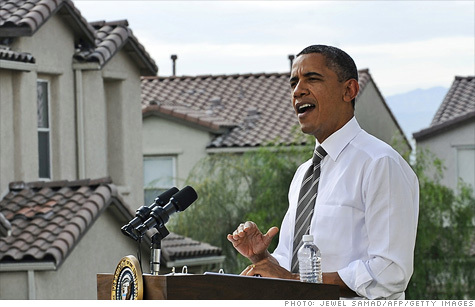 President Obama is expanding his refinancing program, but it won't do much for the housing market. NEW YORK (CNNMoney) -- It might get easier for some homeowners to refinance their mortgages, but that won't do much to help the broader housing market. The Obama administration Monday announced changes to its refinancing program to allow more homeowners who are current on their loans to take advantage of today's super-low mortgage rates. The program is being touted as a way to help stabilize the housing market and stimulate the economy. But without addressing distressed homeowners and helping to clear the foreclosure glut, the effects will likely be limited, experts said. "I would call it much to do about nothing," said John Burns, head of John Burns Real Estate Consulting. "It will help in such a small way, it's almost meaningless." Designed to allow those who are current with their payments but have little or no equity in their home to secure lower mortgage rates, the president's Home Affordable Refinance Program has helped only 894,000 borrowers since the spring of 2009. The administration had originally hoped that up to 5 million homeowners would benefit. To spur take up, the administration is now allowing more people to participate, as opposed to limiting it to borrowers whose loans are no more than 25% larger than their homes' value. It is also eliminating various fees and appraisal requirements, as well as extending the program for another 18 months. And perhaps, most significantly, it will ease banks' liability to repurchase the loans if the borrower defaults. This should increase competition among banks to refinance more homeowners in good standing, administration officials said. Up to another one million homeowners may now qualify, according to the administration. The number could be as high as 1.6 million, according to Moody's Analytics. The announcement is the first of a series of measures President Obama plans to implement to spur the economy without Congressional approval. With his American Jobs Act bogged down in politics and not likely to pass, the president is looking for alternate ways to stabilize the nation's financial house. But the administration acknowledges that increasing refinancing is not a silver bullet to aid the ailing housing market. "This is only one piece of a broader strategy to help the housing market," said Housing Secretary Shaun Donovan, citing federal efforts to assist those who are delinquent or unemployed. The move could help some homeowners who are struggling to stay current with their payments by reducing their monthly obligation by a few hundred dollars. The administration expects borrowers to save about $2,500 a year, on average. However, it fails to get at the root cause of the housing market's problems, which is the 3.5 million homeowners who are either in foreclosure or at least four months behind, said Celia Chen, senior director with Moody's. Preventing "a few households" from falling behind will be of marginal help. The effort really is an economic stimulus program, experts said. By reducing homeowners' monthly payments, it will allow them to spend money on other things and spur demand. "Hopefully, they'll be going out shopping instead, which the economy does need now," Chen said. "Any boost will have a positive impact." Not everyone, however, will benefit from the program. Mortgage investors will see the value of securities comprised of higher-rate loans reduced once they are refinanced. These investors, in turn, will have less money to spend. "The benefit to the economy may be outweighed by losses to investors," said Mahesh Swaminathan, mortgage strategist with Credit Suisse.